These Counter Art decorative coasters feature a natural stoneware construction that absorbs drips and condensation from beverages, protecting your tables and countertops. The beautiful, detailed design is a transfer print with permanent ink that is FDA approved. A durable, natural cork backing on each coaster also prevents scratches on your furniture, while the wooden display holder keeps the coasters attractively displayed and readily available. The four round cork feet on the bottom further protect your surfaces. 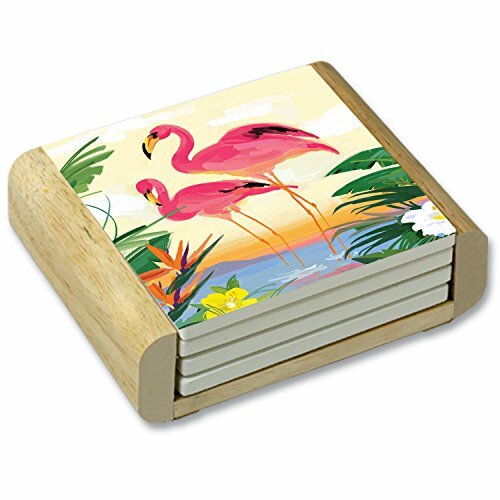 Packed in a set of 4 inside an attractive wooden holder. Makes a great gift!. These CounterArt decorative coasters feature a natural stoneware construction that absorbs drips and condensation from beverages, protecting your tables and countertops. 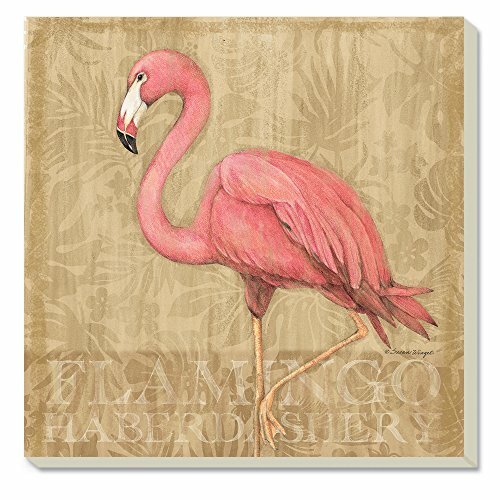 The beautiful, detailed design is a transfer print with permanent ink that is FDA approved. 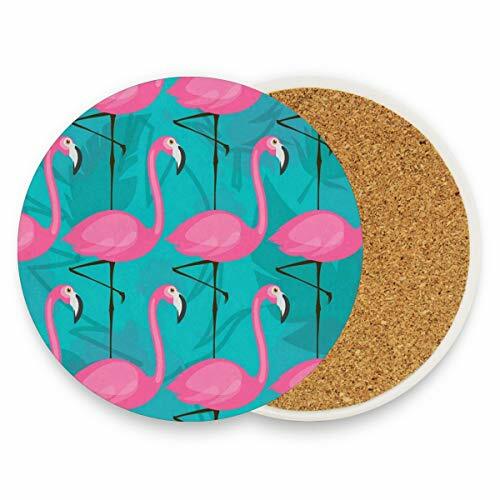 A durable, natural cork backing on each coaster also prevents scratches on your furniture. These coasters measure 4 inches across and come packed in a set of 4. Makes a great gift!. This CounterArt individual car coaster features an innovative design for keeping your vehicle's cup holder dry from beverage drips and condensation. Crafted from a durable stoneware material that continuously absorbs moisture, this coaster has a convenient finger slot on the side, making it easy to remove for cleaning. 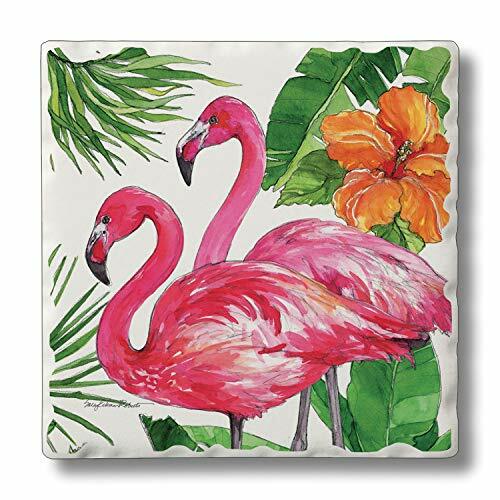 The decorative transfer print is FDA approved and has an attractive, artistic pattern, and we offer many colorful design options for your own personal taste-use it in your car, van, RV or boat. To remove coaster stains, soak coaster in 1 part household bleach and 3 parts water until stain lifts, then rinse and air dry. Our car coasters make great add-on gifts and are perfect as a stocking stuffer or party favor. Measures 2-1/2 inches across. Form meets function with these CounterArt decorative coasters, featuring natural stoneware construction that absorbs drips and condensation from beverages, protecting your tables and countertops. 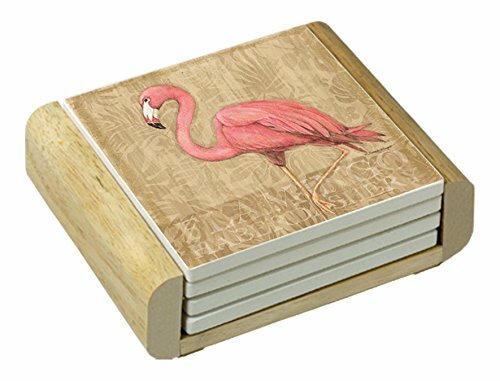 The beautiful, detailed design is a transfer print with permanent ink that is FDA approved, and the durable, natural cork backing on each coaster also prevents scratches on your furniture. The wooden holder has protective cork feet on the base, and keeps the coasters attractively displayed and readily available. 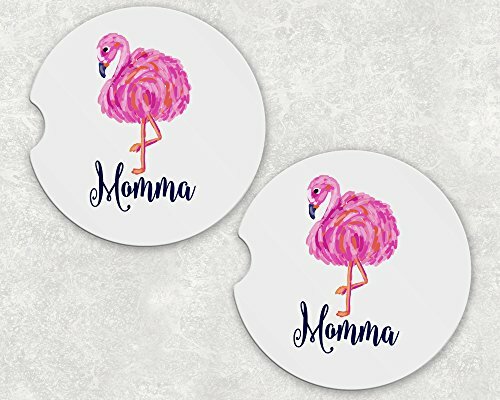 Our coasters will add a touch of style to your unique home decor collection, while functioning beautifully at cocktail parties, happy hour, on game day, or simple everyday living. These coasters measure 4 inches across and come as a set of four in an attractive wooden holder, and are available in a wide variety of styles and colors that are great for gift giving occasions such as housewarmings and weddings, or for hostess gifts, anniversaries or birthday presents! This coaster gift set is a beautiful ensemble that will add style and elegance to bookshelves, coffee tables or countertops. To remove stains, soak coaster in 1 part household bleach and 3 parts water until stain lifts, then rinse and air dry. 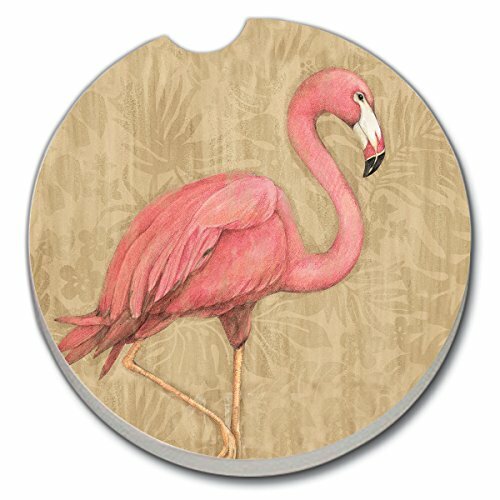 If you care about your delicate counter surfaces, these absorbent stone coasters have a unique design with a cork backing, which will not only give an exceptional atmosphere to the table, but also protection from scratches and spills. 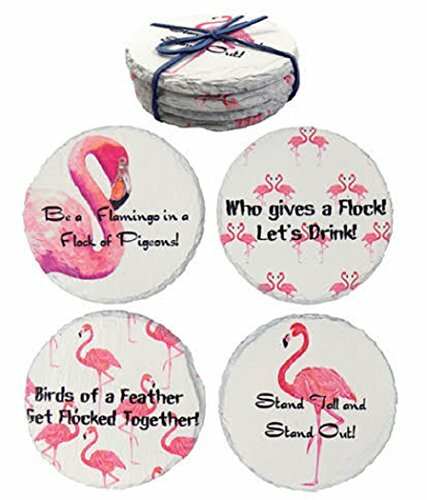 FEATURES & BENEFITS Due to good sizes of 4", round form and appropriate weight the ceramic stone coasters will always stay on the table and will be good for any size cups or glasses. The coasters will absorb 100% of the condensate droplets or any moisture from cold or accidentally spilt drinks. The special cork backing won't leave any scratches or marks on the surface and provide a better grip on the coaster. Absorbent ceramic coasters made using diatomaceous earth are being very durable, stable to bumps and drops as well as nice to the touch. The unique design of stone coasters will give the table an extra charm and serve well as an eye-catching decor. 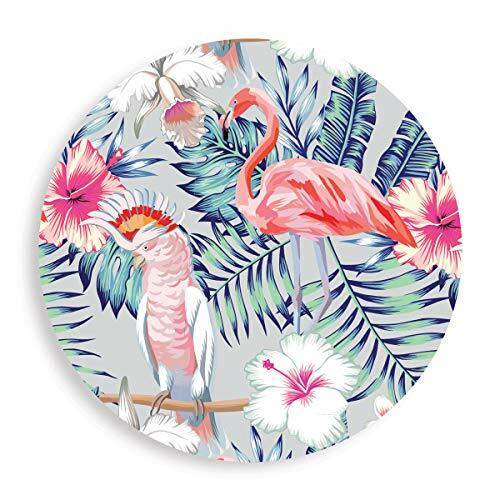 SIZE OF DRINK COASTER Diameter - 4inch (10cm) Thickness - 0,24inch (0,6cm) Perfect GIFT for anyone! Search no more! A must have coasters in everyone's collection! Absorbent Stone Coasters are crafted from a natural stoneware material that absorbs drips and condensation from beverages. A durable cork backing protects the surface of fine furniture. Shopping Results for "Flamingo Stone"